This is what goes into my carry on luggage for a long haul flight (usually London to Melbourne). I use a Samsonite carry on suitcase. For which I have a personalised travel tag which I love, thanks to The Daily Edited. My laptop and phone which has a personalised cover. I always pack a usb phone charger as well because most planes now will have a port for you to charge your phone in. My camera, if you sit in a window seat you could fly over amazing views and take off and landing can provide a site of a city from above, also I don’t like to put valuables or breakables in my checked luggage. My Kiki K passport holder and my glasses ( I have to be able to see the signs). I am a law student so I pack study books and pen. I also always pack a book to read, in flight entertainment gets blanked when the pilot or flight attendants want your attention and if you are flying on a long haul flight you have potentially heard the safety instructions once or twice already and sometimes its just nice to read instead of watch TV. Toiletries I like to pack deodorant a mini moisturiser from The Body Shop as my skin gets dry when I fly, a lip balm, a hair brush, my favourite BB cream in case I have to see someone I know and a roll on perfume, because everyone wants to smell nice. On the plane I wear my super comfy nike trainers, a jumper, and a pair of crepe pants. The one in the picture are by Gorman, I also have another pair by witchery which are black and have an elastic waist so are even more comfortable. The trousers are a tapered fit so even though they are comfortable they are also somewhat stylish. Finally my Uniqlo puffer vest which is great for a multitude of reasons. 1. 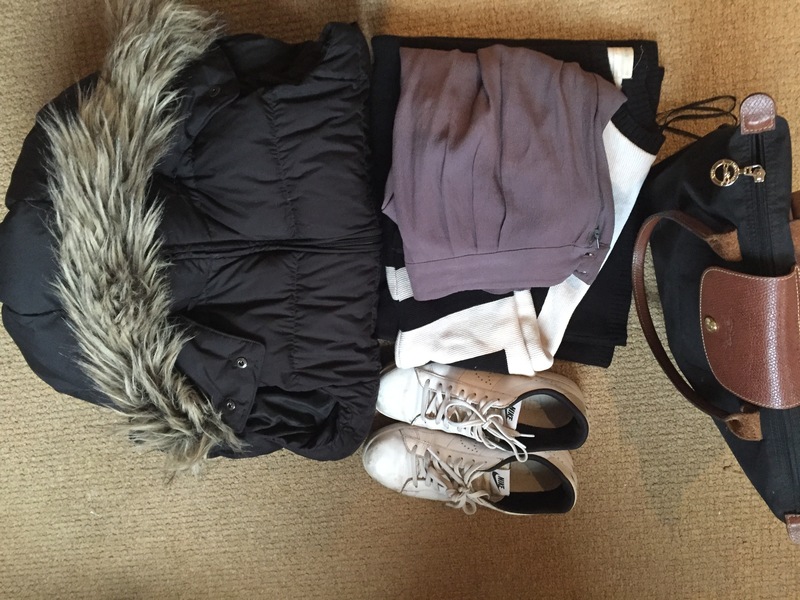 If you are on a long haul flight you are potentially going from summer to winter or vice versa and so will need something that can be small and keep you warm. 2. the hood is great for covering your face when you fly and are trying to sleep or using it as a pillow. Also why I pack an eye mask. 3. It is great to have an extra layer for the plane in case you get cold. I also carry my Longchamp handbag as I like to put my passport wallet and drink bottle and anything extra I might buy in it so I can have easy access to it. At the other end it is easily folded up and stowed until I need it again. That’s a great post! I also wish I’d read this before embarking on my trip, although I do like having a backpack that lets my hands be free. I love how little we actually need to travel the world, one of the oft-unspoken extra benefits of travel. I enjoyed seeing the inside of your luggage. I should’ve done that, too! 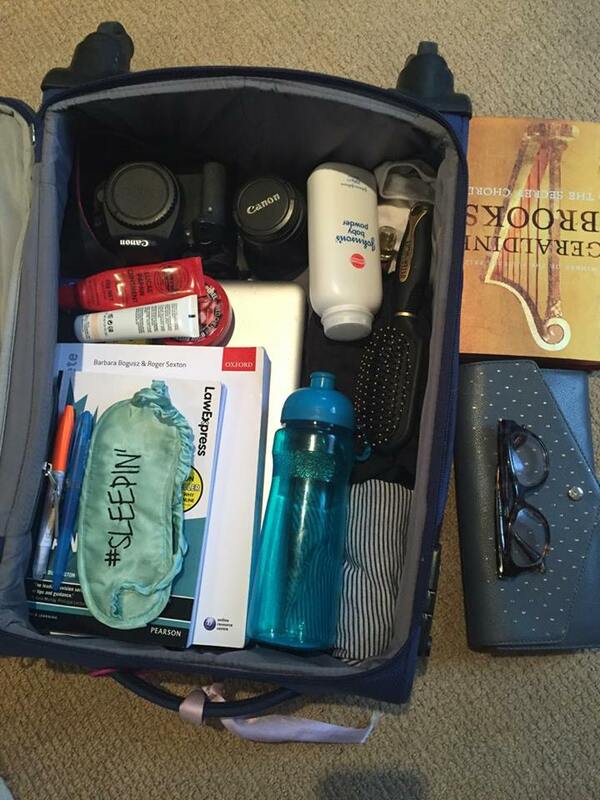 We have similar packing styles and yay for the Canon DSLR! I have flown from the US to Australia, and it is a long haul! You look prepared no matter what happens. Fly in comfort as you enjoy the adventure! Thanks for stopping by and liking my blog. Good luck on your future travels! I’ve heard so much about it and even bought one, but haven’t tried it out yet. I love seeing what other people pack! I also love a peek into other people’s suitcases. I travel between 50-65% of the year, a combination of business and pleasure. My travel style has evolved over the years, but I’ve settled on a few must-haves. I often check my bag but for what I take on the plane: Tissues, water, phone, charging cord, Kindle/paperback book, lotion, lip balm, ibuprofen, warm fuzzy socks (Target has some of the best I’ve found, although randomly the grocery store Rewe here in Germany also sells pretty soft ones), gum, pen and paper. I also always now dress in layers, regardless of destination. I’ve yet to have a flight that was a consistent temperature throughout. I love TravelPro suitcases (used to love Samsonite but a friend’s recommendation convinced me) and Longchamp bags for carry on. In fact one of the best investments I’ve made was the large Le Pliage bag that expands – I’ve used that thing all over the world. It wipes down easily, and the company will repair any holes/tears for life. The Longchamp bags are an absolute must for me. I prefer the medium one only because I have used the large ones in the past (I have a beautiful blue one) however I always overfill it and then my shoulder starts to get sore etc. which is why I know use the combo of backpack and handbag, I usually try to pack the backpack with my laptop in it and then it is really easy for security and it slides straight back into my suitcase. The other benefit of using a carry on suitcase is that you can rest your bag over the handles and not have to carry it. A girl after my own heart. In addition, I always pack a cashmere shawl to keep me warm – I hate those scratchy airline blankets. Plus, I wear compression socks. What do you pack in your checked luggage? I love to travel but tend to overpack so I always have a lot to haul around. I’d really like to be more efficient in my packing so I don’t take so much but have what I need. I always pack a book with the full intention of reading during a flight, but, I always seem to get too distracted by the surroundings. How do you manage to overcome this? Did you love Scotland? I went in 2005 and loved the Queens Mile I think it was called and the castle! Thanks for checking out my recent blog posts 🙂 Love this post- I’ll never forget leaving Oz in 40 degree heat wearing winter boots because I was travelling to Finland where it was 60 degrees colder! Hi, thanks for stopping by my blog and liking one of my posts. I’m having a chuckle because I have a black Samsonite and I also take my Longchamp bag with me. Happy travels! I’m so glad you liked a post on my blog, because it brought me to yours! So much fun to see what a fellow traveler packs and hearing I’m not the only hoodie devotee for inflight naps. I’m headed to Italy, Spain, Portugal for 3 months soon, so it’s good inspiration and the commentary you got is super helpful too! 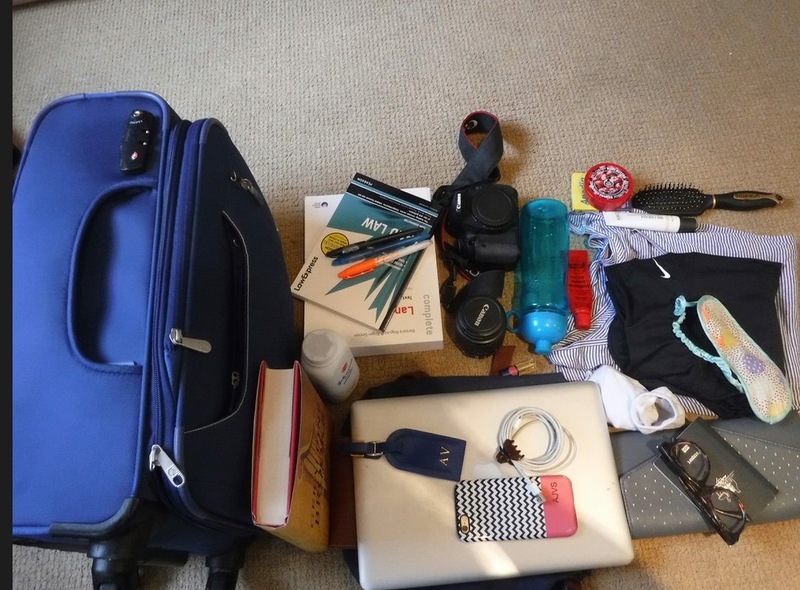 To contrast that a bit – and a) I’m a guy which does cut down on some things or so they say and b) I’m not a student so don’t have to carry that much study material – I somewhat strictly pack carry-on only! Informative, well said, Just good!